Samford University’s Cumberland School of Law recently honored long-time professor Michael E. DeBow as the inaugural Steven Everett Wells Professor of Municipal Law. The ceremony opened with a welcome to guests by Dean Henry C. Strickland followed by an invocation by Provost and Vice President Michael J. Hardin. President Andrew Westmoreland provided words of appreciation for endowed chair sponsor, Stephen Everett Wells, and remarks by DeBow. 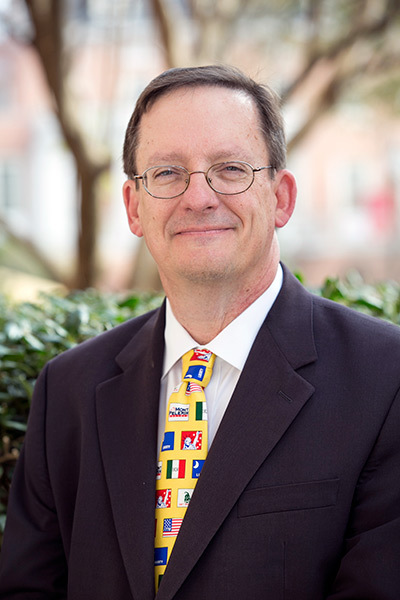 DeBow joined Cumberland School of Law faculty in 1988 following experience as a judicial clerk in the U.S. Court of Appeals, a legal advisor in the Federal Trade Commission and special assistant to the Assistant Attorney General Douglas Ginsburg, in addition to private practice. To be considered for the Wells Chair honor, DeBow met all of the requirements including accomplishments in the field of local government and municipal law and the economic analysis of local government and municipal law. Additionally, DeBow’s superior accomplishments in scholarship and research, teaching and service were considered, Strickland said. Also, DeBow has conducted research on municipal law, providing input on and speaking to municipal law CLE programs, and participating on amicus briefs. Recommendations for the Wells chair were solicited from the law school faculty. Strickland then made the recommendation of DeBow to Westmoreland and Hardin, and he was officially affirmed last fall by the university’s board of trustees. “The chair creates an opportunity for Samford University and Cumberland School of Law to partner with Alabama’s municipalities to work for the benefit of cities and towns across the state and their citizens,” said Strickland.